If you’re a keen enthusiast of overlanding, it means that camping is 'your thing'. 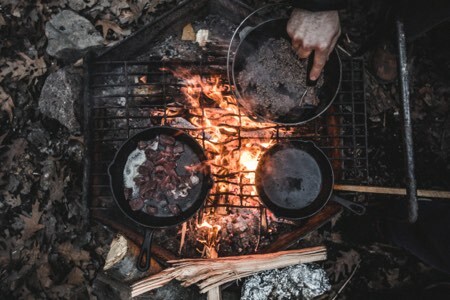 And while cooking outdoors is definitely enjoyable, you should have the appropriate equipment for this purpose – I’m referring to camping stoves, of course. Nevertheless, one thing is for sure: the diversity of products to choose from – both online and in physical stores – is overwhelming. Essentially, you end up asking yourself: which camping stove should I get, which one is the most efficient and most convenient to use? Each product is recommended for a particular utilization, having specific features, advantages, potential drawbacks, so on and so forth. Rest assured, though – we have your back. 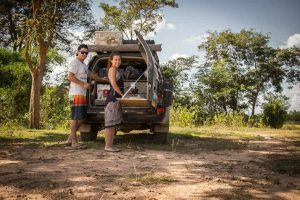 Overlanding is our thing, and this includes camping and cooking on a camping stove. We used our comprehensive experience to create this guide. And it contains nearly everything you should know on the topic so that you can make a fully informed purchase. First things first: we’d like to talk about the main categories of camping stoves. We’ll briefly outline their primary characteristics. Backpacking camping stoves are known for their unparalleled convenience. That is to say, they are small and relatively lightweight – weighing from 80 grams to 1 kilogram. There are even some models that are used exclusively for boiling water, while others can be used for simmering and cooking food, as well. Essentially, the convenience of backpacking camping stoves comes with a compromise – their advantage is a disadvantage at the same time: they are usually very small. Typically, they are made of aluminum or titanium. 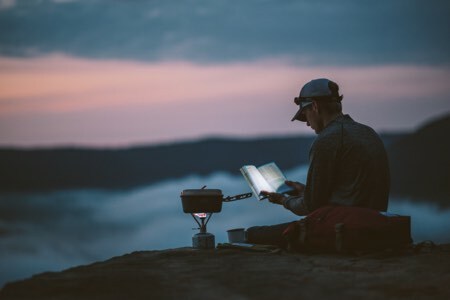 Even so, bear in mind that even when it comes to overlanding, a backpacking stove can turn out to be quite useful for boiling water for tea or coffee – especially if you don’t want to get a car camping stove for the job. On the other hand, camping stoves are on the larger, heavier side. This would make it difficult to carry them at a considerable distance from your vehicle. Depending on the model, a camping stove can have 1, 2 or 3 burners. Concurrently, most units are equipped with a folded lid for storage, which also offers wind protection. Later in our article, we’ll assess the characteristics of each subcategory. Now, we’d like to talk about something that mustn’t miss your attention – namely the features you should look for in a camping stove. 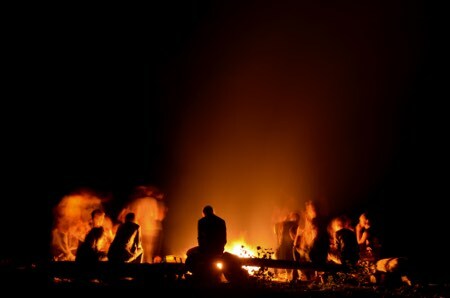 For one thing, you should determine the size of the group you’re camping with. In this sense, there are two primary categories to choose from: namely compact models you place on a tabletop or large, free-standing camping stoves. If you’re cooking for a small number of people, a single burner might be perfectly suitable. Such a unit takes up the minimum amount of space while being lightweight and really practical. In the meantime, the two-burner setup is the second most common, being a versatile unit in a compact form. You can use it for cooking breakfast and boiling water for your daily dose of caffeine, while prepping some veggies – it’s up to you. And lastly, the multi-burner is suitable for larger groups of people. 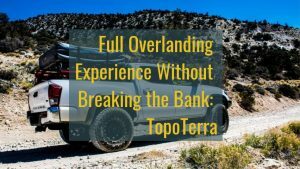 At the end of the day, it’s your overlanding habits that should help you pick. The second most important consideration is definitely the power of the burners. Note that the power of a camping stove is measured in BTUs (British Thermal Unit). BTUs account for the amount of energy necessary for heating or cooling a pound of water by one degree Fahrenheit. In plain English: the more BTUs a camping stove has, the more powerful it should be. Still, this isn’t everything. The design of the stove is just as important, in this respect. That is to say, you should assess the actual diameter of the burner. To be more specific, a small burner might produce a small hot spot, which will make your food heat unevenly. On the other side, a larger burner spreads the heat much more evenly. Hence, if the diameter of a burner is wider, it will be better, performance-wise. A characteristic that is, many times, overlooked, is the wind resistance of the camping stove. 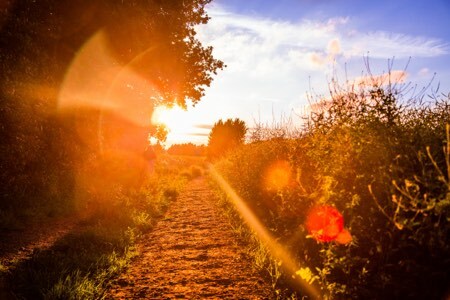 When you’re outdoors, it goes without saying that you are exposed to all the elements. And there is a real struggle, in this respect – that of cooking in windy conditions. Wind can significantly influence the performance of a stove. In fact, even the most subtle breeze might throw off your cooking, specifically when it comes to simmering at low heat. As a rule of thumb, models equipped with big windscreens will keep the wind out more efficiently. Best camping stoves would be equipped with wind protectors. In spite of that, the place where you put the burner plays an essential part, as well. Plus, in any case, you can fabricate a type of barrier to protect the stove or, alternatively, improvise with the gear you have at your disposal. A camping stove’s design is just as important, and this includes the adjustability of the legs, as well. In fact, numerous models come with this design feature, so that you can level the stove accordingly. If not, once again, you’ll need to improvise with some rocks. Depending on your cooking preferences, you might want to get a camping stove with excellent simmer control. This depends on the type of meals you’d like to prep. For example, if you want to make oatmeal, risotto or polenta, you’ll need a stove with decent simmer control. Essentially, note that this entails very precise valves. Bear in mind that the lower-end models don’t have that. 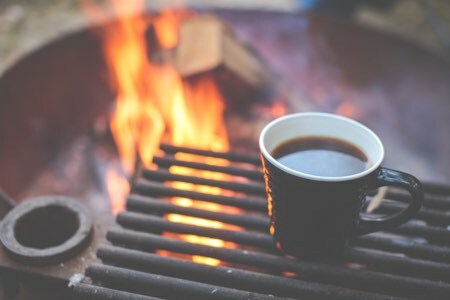 As we’ve mentioned beforehand, there are several ways in which we can categorize camping stoves – one of them being by the type of fuel they run on. That being said, we’ll start by presenting gas camping stoves, which are separated into cartridge/canisters and cylinders/tanks. The gas utilized in most units is a combination of propane, butane or iso-butane. The primary reason why most units use a blend of gas is the following: for one thing, butane is increasingly more stable than propane, specifically at ambient temperatures. This means that the gas is safely stored in a relatively lightweight canister, in comparison to the heavy-duty steel tanks that are necessary for storing pure propane. Moving on, butane doesn’t vaporize at low, below freezing temperatures. In the meantime, propane does that. That is to say, thanks to the relatively low percentage of propane – of roughly 20 percent – you can operate a canister stove in really cold weather. However, to ensure that the stove burns both types of gas, it’s essential to maintain the stove fairly warm. That’s because if the canister is cold, then the stove will immediately burn off the propane, which would leave you with a canister half-full of butane. So, a noteworthy disadvantage associated with gas camping stoves is their reduced reliability in the winter season. Hence, many overlanders prefer liquid gas systems – specifically during the winter. But we’ll get into more detail later in the article. Moving on, the majority of manufacturers utilize the same Lindal valve, which is pretty standard for the industry. That would mean that no matter the brand of the stove, you should be able to pair it with any canister whatsoever. 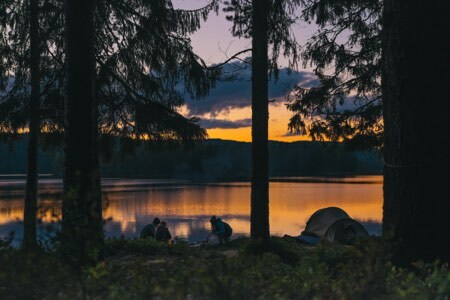 Even so, as a rule of thumb, manufacturers advise campers to purchase both, since they don’t have any control whatsoever on the quality of the competition’s products. Another potential drawback is the fact that the fuel might not always be readily available. While this is a minor drawback, it is still worth considering, if you were to assess the convenience of gas camping stoves. It’s true that you can find decent quality canisters at most stores. Even so, if you’re in a remote town, and you find yourself needing a canister, you might not find one. However, a four-ounce canister is sufficient for two people, for three days max. That is to say, as long as you plan in advance, you should be prepared. Essentially, a gas cartridge stove uses a combination of two liquid petroleum gases – namely propane and butane. Many campers choose this type of unit because it is lightweight, portable and the flame is easily adjustable. At the same time, re-sealable cartridges can be easily removed from the stove when they are partially full. This is practical for safety and convenience reasons. Also, the fact that you can accomplish instant lighting is really advantageous. A disadvantage, however, could be that cold weather might impair their effectiveness. This may happen as the cartridge empties, as well. On the other hand, a canister stove includes a small stove that doubles as a pot stand, featuring a pressurized fuel canister. However, there are also larger, 2-burner units on the market. For the smaller ones, you attach it directly to the stove by using the screw-threaded valve. Setting it up is incredibly simple. At the same time, these units are quite lightweight. In terms of costs, canister stoves are on the affordable side, in comparison with liquid gas units. That being said, who would benefit most from a canister stove? If you cherish convenience, and you want to benefit from quick boiling times, compactness, and ease of use, then this is the right option for you. Nevertheless, bear in mind that, in extreme cold, these units don’t work. To the largest units you can also attach a gas tank that can potentially last for months. Next on our list, we’ll include liquid fuel camping stoves, which usually run on white gas, also referred to as camp fuel or naphtha, but also diesel, kerosene, unleaded gasoline . In comparison to a canister stove, the units that run on white gas deliver more BTUs – which would provide you with more cooking possibilities. Still, you should be wary about the safety of the unit. Always, but always ensure that the cap of the fuel bottle is closed tightly. Otherwise, the spilled liquid is likely to lead to a fire hazard. It is also essential to leave some air, whenever you refill the fuel bottle. That’s because as the temperature increases, the gas is likely to expand. Once again, the excess pressure could lead to an unwanted incident that could be easily avoided. Since the gas is in a liquid state, you have to pump the plunger manually, in order to create the pressure you need. You should do that until you feel that you’ve reached a firm resistance – roughly 20 pumps will do. Moving on to pre-heating the stove, this is necessary for converting the liquid fuel to gas, for attaining excellent performance. Considering that the fuel bottle is remotely connected to the stove, this means you can attempt to surround the stove body by using a sunscreen or a heat reflector – or both if the situation asks for it. This can be life-saving in unfavorable camping conditions. Still, as a piece of advice, before you go on your overlanding adventure with your new camping stove, you should give it a go in your backyard, to know what to expect of it. This way, you won’t be caught off guard in the middle of nowhere. While that can be nerve-wracking, this scenario should be avoided. If you want, you can pick a multi-fuel stove, for a boost of versatility. As you can anticipate due to their name, multi-fuel stoves can run on a wide range of liquid fuels. That is to say, some units run on white gas, diesel, kerosene, unleaded gasoline, aviation fuel, and the list may go on. Just as we mentioned already above, also for unleaded, diesel, kerosene etc. stoves, you have to create pressure in the fuel tanks with their respective pumps in order to ignite the stove. Hence, for international overlanding trips, multi-fuel stoves are always preferred, specifically due to their versatility. That is to say, if you plan on exploring rural, rather remote areas, in which getting across a canister of white gas is quite improbable, such a unit will definitely come in handy. 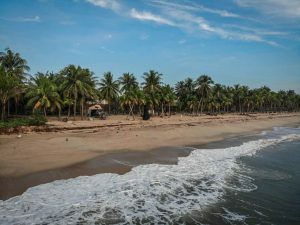 On the other side, multi-fuel stoves are quite expensive, meaning that they require a considerable upfront investment – not everyone can afford one. Plus, because their construction is rather complex, they can be more difficult to operate. Also, you should ensure that the liquids you use are clean – otherwise, maintenance performance will be necessary. Furthermore, it’s time to present alternative-fuel stoves, and this category includes wood burning camping stoves, as well. 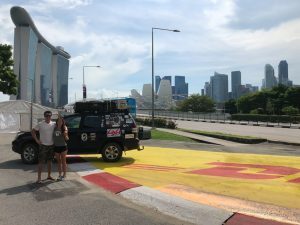 Presumably, the most convenient characteristic about this type of unit is that you don’t have to carry any type of fuel – that’s because, during every overlanding adventure, you have access to pine cones, twigs, buffalo chips bark, and the list may go on. Nevertheless, bear in mind that, in terms of performance, wood-burning stoves aren’t as efficient as liquid gas systems, for instance. Plus, they also generate a significant amount of ashes. That is to say, you’ll have to put some time aside for cleaning. What is more, they aren’t allowed in specific wilder areas that don’t permit an open flame. Still, if you are cooking in an open place, then a wood stove might be a decent option – but for a closed area, it won’t do. It comes down to the place where you’re camping. Solid fuel camping stoves are, generally speaking, really lightweight, featuring a simple, straightforward design. Nevertheless, the thing with solid fuel camping stoves is that they are far from being the quickest out of the categories we mentioned in our guide. Usually, these units run on tablets, which are made of an inflammable chemical compound that was initially developed by the military, being a portable fuel source. So, aside from the solid fuel tablet, you’ll also need a platform or stand, in order to suspend the pot above the tablet. Nonetheless, you don’t have the option of adjusting the heat output. Also, in terms of performance, a gas stove is much more powerful, for example. That being said, why would someone consider a solid fuel camping stove? Its main strength is its compactness, and the fact that it is really lightweight. Hence, if this is a priority for you, it makes sense to invest in such a unit. However, since the operating time is slow, this would require you to have a lot of time on your hands. What if you don’t want to deal with any fuels whatsoever? Is there an alternative worth considering in this respect? Yes, there is – we’re talking about solar camping stoves. These represent a fairly new concept in the camping world. For the most part, such a unit utilizes the heat from the sun by concentrating it into a specific angle, by using some reflectors. The result? You’ll get a specific angle where you can cook your meals. That is to say, as long as you have access to the sun, this means you can take advantage of such a unit, during your outlanding trips. Surprisingly, the market abounds with plenty of products that offer excellent results, especially for the price. To be more specific, we recently had the chance to test such a stove manufactured by GoSun, and the results were impressive, at the very least – we got to enjoy a bunch of delicious cinnamon rolls. On the other hand, the drawbacks are evident: it takes much longer to cook something, in comparison with other types of camping stoves. Not to mention that solar cookers aren’t necessarily fit for every climate and weather. Also, this implies planning your meals depending on the sun, its location, so on and so forth, which can be rather inconvenient. You might feel a tad overwhelmed after reading this guide. And while we included a lot of information on different types of camping stoves, this should only make the buying process easier. The final question is – what is the best camping stove for overlanding? As a rule of thumb, investing in a two-burner, liquid fuel or gas camping stove might be an excellent option. That’s because, performance-wise, it offers the fastest and most convenient results. Having an additional small camping stove can be very handy. Preparing a quick snack or coffee by the road makes your brakes a lot more hassle free. So these are great for quick stops, but not for real cooking at campsites. That's when you'd use your two-burner. 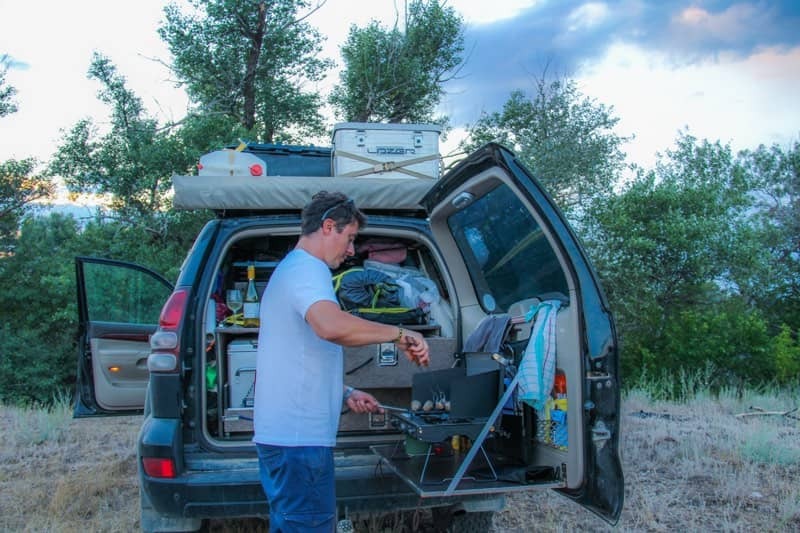 To conclude, we find that a liquid fuel or gas two burner camping two stove together with a very small gas stove (used for boiling water quickly) is best fitted for an overland setup.